Welcome to our house, where meals are shared, friendships are formed and family traditions are our passion. Our story began back in 1971 when Lisa’s Great Uncle Joe Zimmermann opened the doors to his first location in Hyde Park, a neighborhood located on the south side of Chicago, Illinois. A short time later, in 1972, Uncle Joe opened a second location at 2020 Lincoln Park West, where it remained for 44 years, until it was relocated to 616 W. Diversey Parkway in 2017. Being passionate about sharing a multitude of mouthwatering culinary masterpieces, Uncle Joe recruited Don LaRoche, husband of his niece Sandy, to assist and learn the business. Together, they opened two additional locations; one in Oak Forest, Illinois in 1975 and another in Chicago’s Gold Coast on Bellevue Place, just a year later. At first, Don taught school during the day and managed the Oak Forest location at night and on weekends. He quickly realized his teaching background helped him keep his team motivated and knowledgeable, and he truly loved mingling with the public. Sharing Uncle Joe’s passion for serving great meals made from the most natural and preservative free ingredients available, Don decided to give up teaching and pursue his love for pancakes! Don and Sandy purchased all 4 Original Pancake House locations from Joe in 1986. With Sandy working behind the scenes doing payroll and bookkeeping, Don quickly became the face of the business, taking great pride in his loyal guests as well as introducing family favorites to new customers. In the meantime, their daughter Lisa worked as a hostess and then a server at the Oak Forest Original Pancake House while in high school and college. She developed countless friendships with employees and customers while there and knew this was the career for her. She attended Purdue University to study Restaurant/Hotel Management and Business where she met her husband, Steve Sczurek, who was studying mechanical engineering. Steve continued his education, earning a master’s degree in business, but soon felt the undeniable draw toward the pancake industry. He eventually gave up engineering to fully dedicate his time to learning all he could about the family business, where he soon became known as the “pancake engineer”. 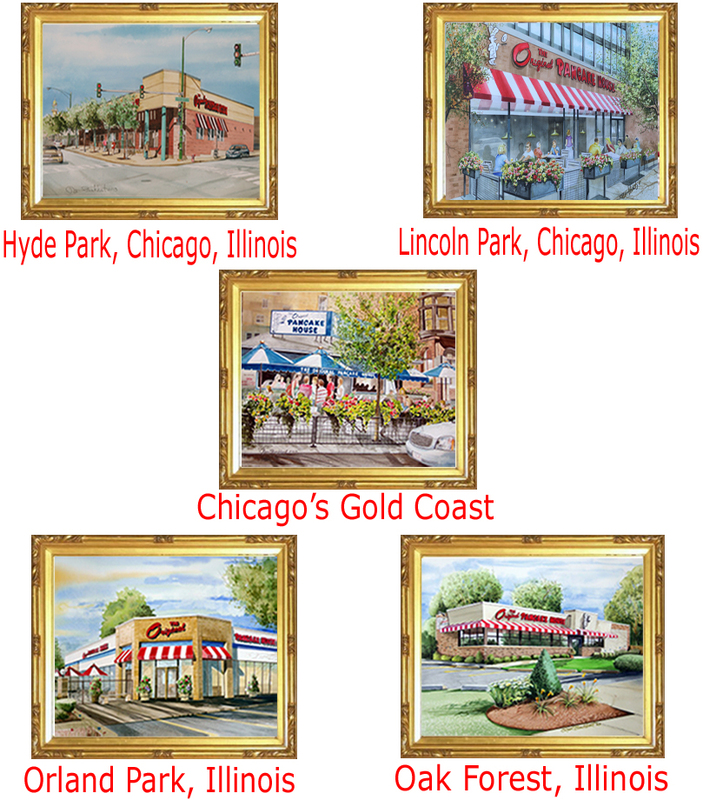 In 2003, when Lisa’s parents were ready to retire, Steve and Lisa purchased all four franchise locations from them and added another location in Orland Park, Illinois in 2004. The Sczureks are proud to call Orland Park their home where they are raising 5 children who can be seen around the restaurants, enjoying the wonderful family atmosphere, serving customers, clearing tables or even devouring some of their favorite breakfast choices. It is Steve and Lisa’s hope that some of their children will share their passion for the family business. They look forward to passing along wonderful family practices that began over 45 years ago with Uncle Joe, from exceptional techniques in using the finest ingredients available for all batters, syrups and sauces prepared on the premises, to hand squeezing orange juice and brewing their special blend coffee. So, stop in any of our five Chicagoland locations to share a meal, form new friendships and experience heart-warming family traditions. From our family to yours, Enjoy! We know you can taste the difference.